Cat-themed towels, shower curtains, and a trinket dish remind us humans who's boss. Felines spend the better part of their day grooming themselves. Why not take a cue from them and fix up the room where we humans do most of our grooming? Your bathroom doesn’t have to be boring — these offerings will add some feline flair. I’m always searching for the perfect shower curtain. Well — Super Kitty to the rescue. I found this curtain on Etsy in a shop called FuzzyInk. 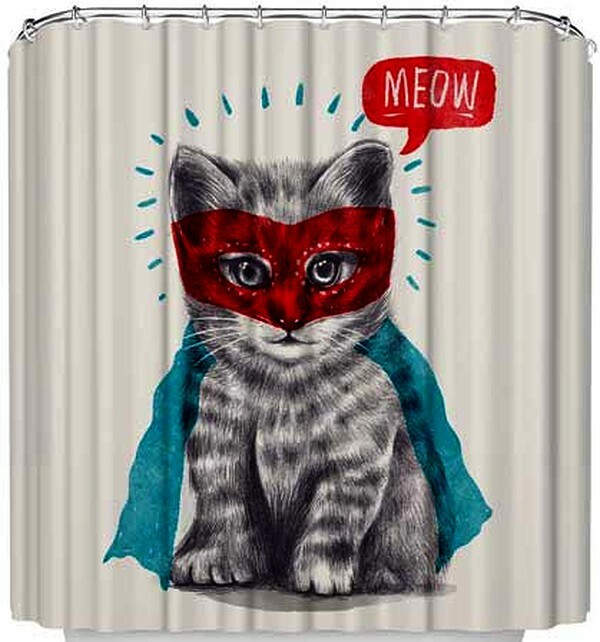 How fun would it be to see this cute feline superhero every time you walk into your bathroom? The shower curtain comes in two sizes (standard and extra long) and includes 12 buttonhole eyelets for hanging. 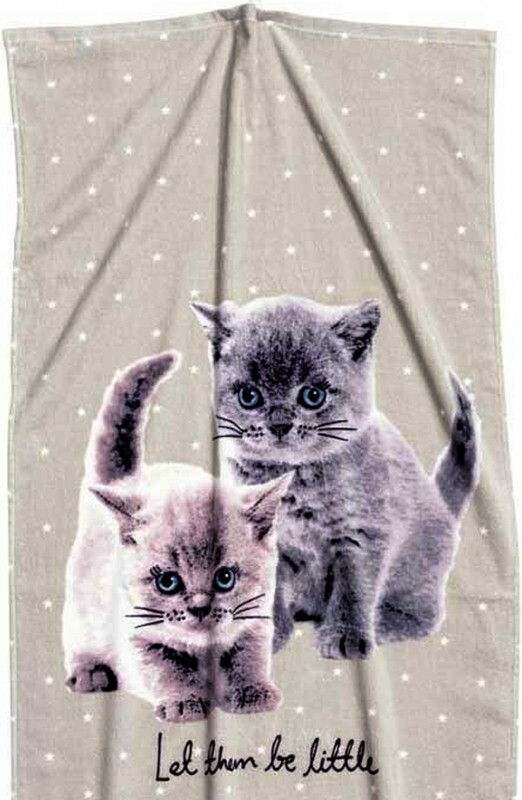 Known for fun and stylish fashions, H&M offers this cute cat-themed bath towel. I actually saw it in the kids’ department, but these are kittens, so it definitely works. Made of soft and comfy velour with cotton terry cloth on the back, it measures 24 by 29 inches and features hanger loops on the short sides. Retailer Anthropologie always has such great home décor. 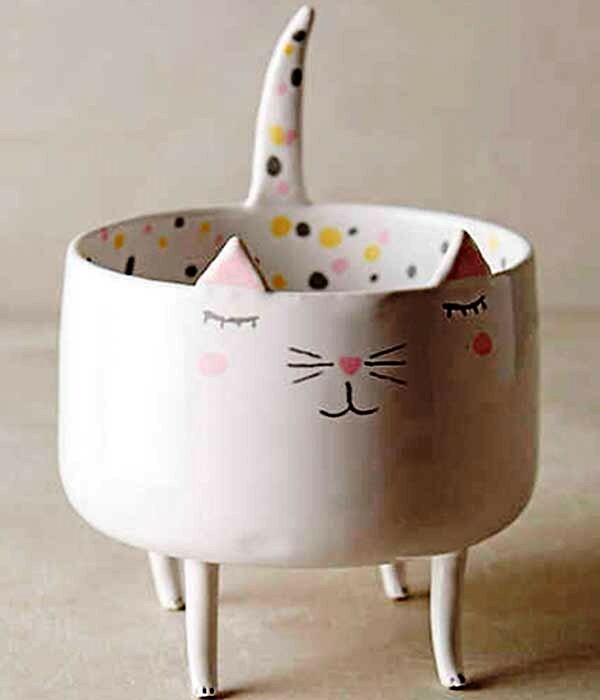 Take this cute kitty trinket dish: Created by Polish ceramicist Marta Turowska, this bowl will add a whimsical touch to your bathroom counter. Not only does the cat have an adorable expression, but the bowl has such wonderful little details — right down to his toes. It’s a perfect place to stick your earrings or bracelets, but it’s also big enough to use as a small plant holder. Looking to add a little feline elegance to your bathroom? Check out these towels from Etsy shop Painted Pooches. 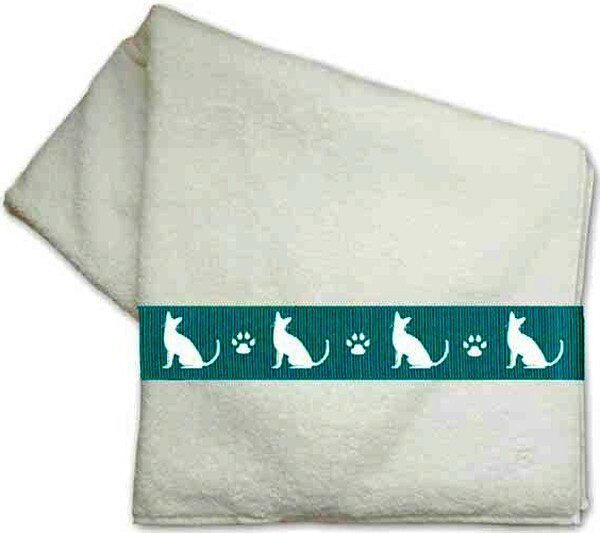 Made of high-quality cotton, the towels come in a variety of colors with the cats on a coordinating grosgrain ribbon. Several cat breeds are available. You can even have your name included on the towels at no extra charge. Sets with hand towels are also available.